Once every while, I like to have a look at second hand shops searching for any nice deal. In one of these visitsI bought a Sennheiser MKH-416 P48 professional shot gun microphone for 275€. But then I had the problem of how to interface it to my videocamera. Phantom powered microphones need some voltage to work. The P48 standard defines how to feed these mics with 48volt through the XLR connector. Of course, I could buy one of the professional fiels Shure FP23 or Sound Devices Mic Pre, but I didn't want to spend that money. There are some other alternatives like the Juicedlink JL-CX231 or the Beacktek DXA-2T, but also quite a spend. Edit (2017): since I made this project some affordable commercial preamplifiers appeared, from brands like iRig, Saramonic, etc. The other option was to build an adapter myself. 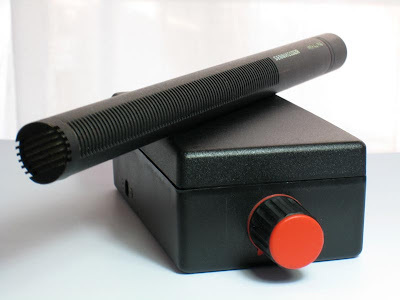 - The 48V Phantom Feed Supply for Microphones by Rod Elliott. - The DC-DC step up 9v to 48v step-up converter by Thomas Schaerer. - The MAX1044 / ICL7660 Negative Voltage Converter (see application notes), needed to get the -9v for the preamp circuit. 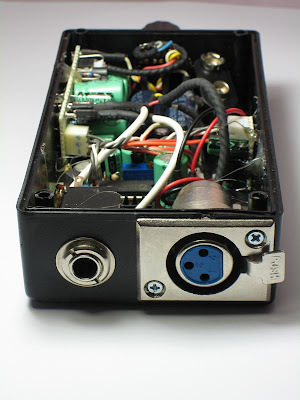 The result is a transformerless cheap 9v portable single mic preamplifier. It is important to remark that it is transformerless. I looked for the proper audio transformers (Jensen, etc.) in order to insulate the mic and the camera, but the prices are too high for this project. I gave the thing away about two years ago, so I don't have it anymore. I'll have a look on my backups to see if I saved some sample recording to share. My name is James McCanna. I am the guy that David generously sent the preamp to in the United States. It is really a cool device and works well.